As a non-degreed potter I have always been interested in non-academic tracks, and while I myself didn’t apprentice, I wish I had. Setting up my studio I spent a lot of time with my collaborators inventing systems and technologies. Had we known any one system well, it would have saved us plenty of missteps and bumbling. (The first firing was a kiln disaster and I remember trips to the corner store in the early days of send out pots poking around for grocery boxes that might somehow nest—no one told me you could order boxes.) I did have information from lots of reading and a few very helpful stints in workshops at the Penland and Haystack Schools. But there is a wide gap between that kind of experience and a practicum where one sees first hand the good, bad, and ugly of an artist making a living producing work. I think it was only blind faith, luck and persistence, that enabled me able to establish my studio and career. I came to having apprentices as a natural evolution from the team-based practice in which I stated out. While it was more freely structured than the way I now organize the give and take with my apprentice, the decision to explore working with an apprentice flowed from the satisfactions I lived with, and the challenges I lived through, working together over a dozen or so years in collaboration with Aaron Weissblum, Sam Taylor, and Michael Kline. Sam and Aaron had their own studio together offsite, but glazed and fired with me, and Michael Kline was housemate and studiomate at first, and finally studiomate until he moved to North Carolina. We were a bunch of hungry and clay-ignorant young men with a large wood kiln and distracting day jobs, figuring it out as we went along, learning from each other’s mistakes and successes, encouraging and pushing each other—competing too. As Aaron moved on to inventing games professionally, and Sam and Michael to their own kilns and studios and families, I needed the help that the wood-firing process demands and wanted the stimulation and fun of working along side others. While this occurs as a matter of course during firings of a large kiln, when a team comes together for several days, the consistency of interaction through the whole making cycle had always felt fruitful. In short, I knew from working with the boys that my creative process is sustained and nourished by community—apprenticeship was an avenue to continue to explore that possibility. It’s quite a jump from working a democratic collaborative, constantly negotiating how why and when things should be done to being in charge. These are very different roles, each with their unique pleasures and difficulties, which is to say that my years working collaboratively prepared me in some ways for the complex dynamic of working over time in proximity to other creative minds. I eased into apprenticeship, beginning with paid assistants like Ellen Huie and Chuck DeWolfe. With Jeff Shapiro’s encouragement and help in setting up a model, I began to take apprentices. There seemed to be a lot of responsibility—financial, personal—the pressure to be some kind of role model—which I was reticent at first to embrace. On a logistical level, one thing that helped make the whole thing work was that as Michael Kline and I were becoming more professional and phasing out of our day jobs, and in the early 90s we began bumping into each other in my studio. 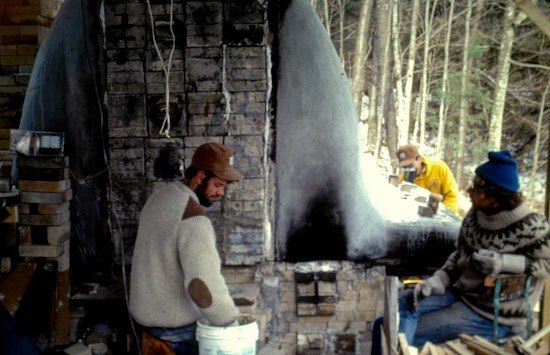 In the mid-1990s I built an addition to be my own studio and a small soda/salt propane kiln, which gave us both the space and flexibility we needed. When Michael moved to a residency at the Penland School, the semi-separate studio space and possibility of firing the small kiln became assets to offer as part of the package I am able to offer my apprentice. With Sam and Michael we had to learn to work to one another’s strengths, and it’s hard to be honest about one’s weaknesses. To be successful potter you need so many strengths: great work, technical knowledge, self-presentation skills, writing, bookkeeping, follow through, etc—few of us have them all. I am challenged to be flexible in bending myself to work with the unique qualities of different individuals who come here. I try to accommodate the particular interests, strengths and commitments of my apprentices—whether Steve Theberge’s political activism or Maya’s soccer team, which Stonepool Pottery sponsored. As my own career changes the apprentice’s job description changes too. I am spending less time doing shows now, and I have worked a lot this winter writing about ceramics. It’s been interesting to think about what the apprentice’s role should be through these transitions. Many have commented about the perils of influence and the apprentice/master relationship has the potential to be a very powerful for both parties—especially jarring for a young person who wants to do this work badly enough to place themselves in the demanding and lightly compensated situation of apprentice. How can the apprentice survive the master’s artistic vision to themselves become a master? We “masters” seem to have everything—the long and faltering way we came into our own artistic voices and established our up-and-running studios is unseen. Sometimes apprentices just have to get away. Michael McCarthy, for example, the year after his apprenticeship ended went to residencies at Anderson Ranch and in the Dominican Republic, two places just about as far away as he could get. Though now he is back in Western Massachusetts and still fires the wood-kiln with me. That was the year that Pedro and Boston went on to win the World Series. In the six years since this panel, it’s gotten harder than ever to become a potter—at least economically. But I’m happy to report that my past apprentices still seem to be finding their way forward. Fergus Moore is teaching and making pots in Missouri. Steve Theberge, who apprenticed young, instead of finishing high school, went on to get a degree in anthropology from Columbia University. After a stint working for the War Resister’s League in New York, he’s now in training to become a Zen monk and prison chaplin. Michael McCarthy teaches pottery at Austen Riggs in Stockbridge, Massachusetts, and has built his own wood kiln a town away. Maya Machin is proprietor of her own pottery nearby in Ashfield, and makes her living making pottery and occasionally teaching. Daniel Garretson has gone for a residency at Red Lodge Clay Center and is heading this fall to Alfred to get an MFA. A talented and inspiring lot.